Wisdom is a powerful gift. It comes from experience- in the case of this book- through lifetimes of experience. 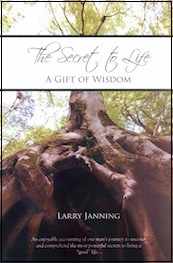 The Secret to Life: A Gift of Wisdom is about life lessons. It’s all about knowledge from experience, but most importantly it’s about sharing your heart. This book is truly a gift of wisdom to the youth. Any proceeds from the sale of this book will be donated to the St. Leonard Benevolent Fund.